Whether you coming to Southern Utah to visit the beautiful national parks or just to 'play'. This is the perfect the right price! Within steps is the Green Spring Golf Course putting green, sand and chipping the street is the driving range. This beautiful home has it all. The community indoor and outdoor pools are only a minute away. Also, at the community clubhouse is a great workout room and pickleball & tennis courts. The home has a large great room and master suite (including king size bed and jetted tub). The second bedroom in the house also has a king sized bed with a bath. The third bedroom has a queen sized bed. The large kitchen and laundry room are well outfitted. On the back patio is a gas grill. Wifi is included. Located within 5 minutes are many shopping areas including Wal-Mart, theaters, and many restaurants. Zion National Park is less than an hour away.
. Out of respect for our neighbors, I'm sorry, but we can not accommodate large group larger than 6, including children. We retired and moved to St George in 1996. My wife was a neo-natal nurse at Dixie Regional Hospital. I started a little mountain bike tour company ( After about 10 years of loving St George, my wife became ill and we were forced to move back to Salt Lake City to be closer to her doctors and our children. Rather than sell our home, we decided to rent it and let other people enjoy it. I believe that this is the perfect location for a rental home in S.G. It is on the side of town that makes getting to the national parks easy. The freeway entrance is only 2 minutes from the house. Shopping, theaters, restaruants, etc are nearby. Not to mention that it is only steps away from the golf course. Even though the weather in St George is beautiful most of the nice to have an indoor pool available during the cooler months. This is one of the few homes in the area where you can walk out the back door to a golf course clubhouse and have all the golf practice areas just steps away. In the clubhouse, about a 1 minute walk across the street. Our family stayed at Mark's Green Springs house for the holidays. My daughter was attending college and we thought we'd enjoy the nice weather with her. Mark was a wonderful host. He was there to greet us and give us a quick tour and then the home was ours to enjoy. Not only was it very homey but it also had many extras including spices, tea, flour and sugar. The sunrise views over the golf course were wonderful to see. 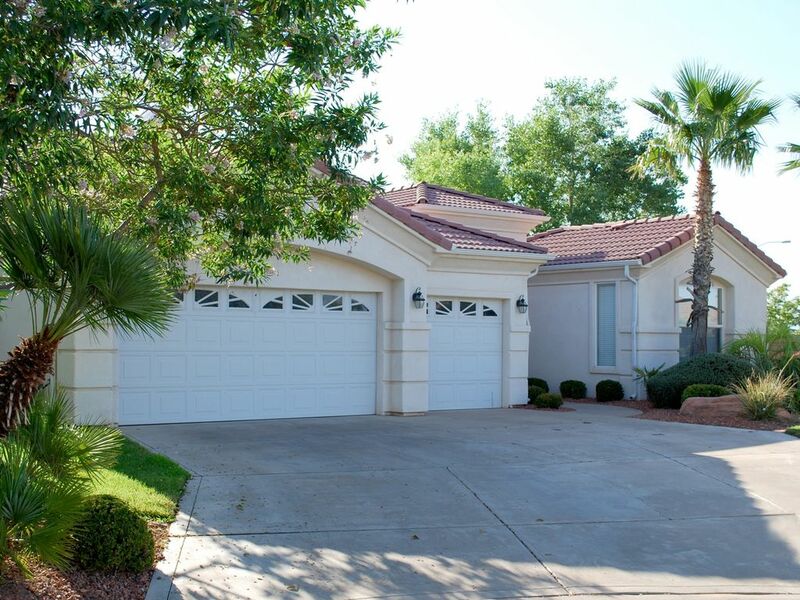 I would not hesitate to recommend this property if you need a temporary home in St. George. Mark was great to work with for our in-between moves. There was plenty of space for the kids and they loved the pools! Great access off and on the freeway and to all the conveniences we needed. We appreciated the garage space, wifi, and the washer and dryer. I definitely recommend! Great home. Three bedrooms which includes casita. The casita has a queen bed and sofa. It also has a bathroom and kitchen.The other bedrooms are great also. The home sits on the golf course with great views. The home is huge and everything is there. It also has fast internet. The home was also very clean. I would highly recommend this home. The owner Mark is really great to deal with. Excellent house in a great location. Listing description accurate and property is very well maintained. The kitchen was clean and well stocked with all of the usual needed items. Same goes for the rest of the house. We felt very fortunate to find such a great place. Owner is wonderful. I would highly recommend this property to a friend or relative and hope it is available next time we plan a vacation in the St George or Zion National park area. We were looking for a house for Easter weekend and Mark went way out of his way to help us out. The house was so spacious for our family of six. We ate our dinners out on the patio. The weather and scenery were perfect. Our daughters loved the bunnies. The house is well equipped and very comfortable. We loved the swimming pools and the park nearby with basketball and pickle courts. We wish we could have stayed longer. I would readily recommend the house to anyone. The St George area Trip Advisor.com's #1 hot spot. Close to Zion NP, Bryce NP, The Grand Canyon NP, Great Basin NP. Great mountain biking, hiking & golf. Tuachan live theater. Other Activities: Best Mountain Bike Trails in the Country!!! Golf: Located just steps from the first tee of the Beautiful Green Spring Golf Course in Washington, UT. Chip, putt, and work on your game while dinner is on the grill. Or relax on the back porch while you wait for the starter to call your group to the tee. This Is The Perfect Golf Vacation Home! The St George area is know for many world class courses at reasonable rates. If you then click on the link to Green Spring Golf Course and the 1st hole...you can even see this home. $300 deposit required. Rates shown are for monthly rentals. Washington City does not allow short term rentals in our neighborhood. I limit the number of guests in the house to 6 people out of respect for my neighbors. Thank you for considering this home for your vacation!! !